Cpl. 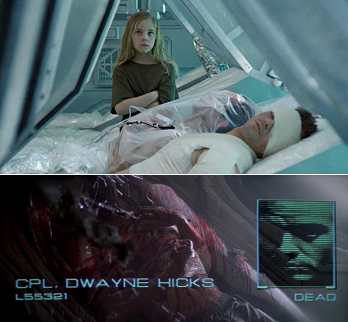 Hicks at the end of Aliens: wounded in action but on his way to a full recovery. Cpl. Hicks at the start of Alien³: decorating the escape pod with his internal organs. So you're a character in a genre where Anyone Can Die — but somehow, you've managed to survive the big confrontation. Once the sequel rolls around, everything should be fine, right? Guess Anyone Can Die after all. In fact, you're likely to bite it in the first few minutes if you appear in the sequel at all. And if you're a Final Girl who's in more than one installment of a Slasher Movie series, your life expectancy drops dramatically. This can happen for several reasons: Maybe a character needs to stay single and the other character is in the way, maybe the actor died between films (in which case the death is usually offscreen, if not expect use of a Fake Shemp) or can only make a cameo, or maybe the character was only popular enough for a token appearance. Or the character is Killed by Request on part of the actor playing them. Whatever the case, Sudden Sequel Death Syndrome often comes off as more than a little mean-spirited, to the point that it can be compared to Fridging or Bridging if handled especially badly. This generally has the effect of making the previous work a Shoot the Shaggy Dog / Happy Ending Override; however the main character will quickly move on with their life. Doing this is a great way to cause a rebellion in the fanbase over what is going to be without a doubt a Contested Sequel. The Snicket Warning Label may be applied here in cases where this strikes characters who got a Happy Ending in the previous work. Compare Not Quite Saved Enough, Downtime Downgrade, Sequel Reset, Back for the Dead (where a long-absent series character is brought back only to get killed off), Bus Crash, Sequel Non-Entity, Happy Ending Override. Contrast with Doomed by Canon, where a character in a prequel gets killed off because his or her death is necessary for the preceding work's plot. This is a Death Trope, so expect UNMARKED SPOILERS! Astonage, one of the mechanics who survives Zeta Gundam and Gundam ZZ is killed off in a blink-and-you-miss-it moment in Char's Counterattack by a missile that impacts the hanger bay. This is probably because he picked up a love interest sometime before the movie. You didn't honestly think that Kill 'em all Tomino would let him get away with that did you? And unsurprisingly his love interest dies too. That's Tomino for you. Male Bridge Bunny Saegusa, who survived Zeta Gundam alongside Torres is redshirted by Yazan in the first episode of ZZ. For most of Hell Girl's second season, the main human characters of the first season are AWOL. Finally Tsugumi appears; she seems fine, but it sounds like something has happened to Hajime. We don't know for sure yet, but the similarity to The Ring is suggestive. Many of the remaining characters from Fafner: Right of Left OVA end up dead in the first one-and-a-half episodes of the TV series. April from Darker Than Black suffered a few serious injuries in the middle of the first season, but ultimately survived and appeared in the second season... only to be killed at the end of the first episode by Hei. JC, the main supporting character of the 1998 video game SiN dies just minutes into its anime sequel counterpart, SiN: The Movie. He goes through a particularly gruesome transformation and has to be put down by his boss, John Blade. This clears the way for JC's younger, hotter sister (whose role and name are identical to her brother's) to join Blade's police force. Izumii Curtis of Fullmetal Alchemist died before the events of the movie, Conqueror of Shamballa, and appears only as a voiceless cameo to reunite with her son Wrath as he dies. The screenwriter and the director wanted to avert this and have her live until some point in the movie where she is given her a dramatic death scene on screen but, due to time constraints, they had to cut this scene. Apparently, Izumi's seiyuu was apologized to for not being able to include her in the movie. In City Hunter's Alternate Universe spinoff, Angel Heart, Ryo's Love Interest Kaori Mikamura dies in a car accident. Goku, the main character from Dragon Ball, is killed withint he first few episodes of the sequel series, Dragon Ball Z. Of course, this being Dragon Ball, his body isn't even cold before his friends start talking about bringing him back to life. Final Fantasy: Legend of the Crystals takes place two centuries after the game it's based on, so one wouldn't expect the main cast to be around in any case. However, Mid and Cid Previa both die very shortly after the game itself ends—Cid from natural causes and Mid from the OVA's Big Bad, which is a major plot point as Mid's ghost is a main character. Done in the anime adaptation of Higurashi: When They Cry. At the end of the first season no main character has died for once and everything looks relatively happy. Cut to the first episode of Kai which is set in present day and has the now adult Rena being the only survivor of the entire town. She was sent away for trying to blow up the school and thus she avoided the town gassing that happens every arc. Despite being the daughter of Suzuka, the title character of Fuuka eventually gets run over by a truck, in the process showing that Fuuka was actually a Decoy Protagonist, and it's another Fuuka who's the real female lead. That said, the original Fuuka still casts a large shadow over the rest of the cast even after her death. That being said, she comes back in chapter 135 - but that was a fakeout as well, as it was just a person who dressed up as her because she admired her. Fuuka is well and truly dead. Danganronpa 3 invokes this throughout Side:Future by putting the old characters in deadly situations. In fact, it might even be Inverted since nearly everyone from previous installments made it out unscathed, while nearly all the DR3-only characters died. The most shocking death of the series was that of one of the franchise's more popular characters, Kyoko Kirigiri. Or not, as it's revealed at the very end she survived thanks to Seiko's antidote. Earlier on, the end of the second episode reveals that Aoi Asahina has bought it. The very next episode reveals that she's okay, and another character just set up a homicide prank while she was asleep using well-placed ketchup. Even Naegi himself comes close to death by getting hypnotized into suicide, but he came out okay too. Johnny Joestar, protagonist of JoJo's Bizarre Adventure: Steel Ball Run, is revealed to have died in a flashback in Part 8 after a Heroic Sacrifice that he made to save his wife and son from a normally uncurable disease. Wonder Man, a key member of the West Coast Avengers who was a major member of the team throughout its run, was shockingly killed in the first issue of the sequel series Force Works. Which had the accidental effect of cancelling his own comic series while it was still going! Doomsday Clock reveals that Seymour, the guy who decided to run the original Rorschach's journal at the end of Watchmen was killed. Issue 4 also reveals that the original Silk Spectre as passed on. The sequel to the Foster's Home for Imaginary Friends fanfic More Than My Friend starts with both Mac's mother and his brother getting into a car accident. This causes Mac to be sent to an orphanage, but eventually Cool Big Sis Frankie adopts him. "How Things Smurf", the third story in Raven Child's The Smurfette Village series, has all but ten Smurfs (both Smurfs and Smurfettes) die off due to a Synthetic Plague unleashed on them by the time the flashback sequence starts. King Harold in Shrek 2 has a good example of a non-death Heroic Sacrifice, as he throws himself in the path of the Fairy Godmother's wand to save Shrek. The result is that his previous 'happy ending' is removed and he is turned back to the frog he was. But he's still alive at the end of the movie, and his wife doesn't mind his being a frog at all. Unfortunately, within the first act of Shrek the Third, King Harold, well, croaks no more... thus kicking off the plot of the film. If you want to count All Dogs Go to Heaven 2, in the beginning, Charlie's friend Itchy gets sent to Heaven after he died by choking on a chicken drumstick and both are reunited. Of course, since the films star dead dogs, this doesn't really put Itchy out of commission at all. At the very beginning of Cars 2, we find out that Doc Hudson's medical clinic has been converted into a memorial museum dedicated to him due to the death of actor Paul Newman. Also, the trophy Lightning McQueen won prior to the events of that film is called the "Hudson Hornet Memorial Piston Cup." Season five opened with the deaths of Michelle Dessler and President Palmer. Another example would be Curtis Manning only four episodes into season six (the fact that he was billed as a guest star, as opposed to a regular was a painfully obvious indicator that Curtis wouldn't be around for the long haul that season). Subverted twice in the case of Tony Almeida: Just three episodes into the third season he is shot in the neck, while in the fifth season premiere he is caught in a second explosion after the first one claims Michelle. In both cases he was supposed to have been killed off, but the decision was ultimately made against it. He does later get stabbed with an overdose of hyoscine-pentothal in the fifth season, but this is reversed to reveal he was saved in time two seasons later. In a literal case of a sequel, early on during mini-series "Live Another Day" it's revealed that Morris O'Brien died sometime after the original series in a car accident. Archie Bunker's Place: Edith Bunker made it to the Spin-Off of All In The Family, but died of a stroke in between the first and second seasons. Arrow: Sara Lance/The Canary survives all of season two, only to get killed off at the end of the third season premiere. She comes Back from the Dead early on in the following season. Being Human sees George get killed in the fourth season premiere, while Nina turns out to have died in between the third and fourth seasons. Captain Barbell: The title character's love interest from the 2007 series bites it in the first episode of the new 2011 series. Chuck killed off some of its recurring characters in season premieres. The season 2 opener had CIA Director Langston Graham killed in an explosion and the season 3 premiere saw temporary Buy More manager Emmett Milbarge get shot by an assassin that was searching for Chuck. Dark Matter: The season 2 premiere sees One/Derrick Moss being gunned down by lookalike Jace Corso. Dexter: In the first episode of season 7, Mike Anderson, introduced in season 6, is shot and killed. He must not have been too popular. Louis Greene was being set by the writers as a major antagonist in season 6, only to get unceremoniously killed by the new Big Bad in the third episode of season 7. The Sixth Doctor's dropping dead in the TARDIS right at the beginning of Season 24. A version of this happens in the TV Movie, where the 7th Doctor makes a brief appearance only to get shot and then die on an operating table. However, being the Doctor, he gets better. Ewoks: The Battle for Endor, the sequel to the TV movie The Ewok Adventure, has a perfect example of this trope. The original movie concerned the efforts of a teenage boy named Mace and his young sister Cindel to rescue their parents from a Big Bad monster that has kidnapped them. With the help of the Ewoks, they succeed and the first movie ends on a happy note. Barely 10 minutes into the second film, however, Mace is killed, and so are both parents. Cindel is the only human protagonist from the first film to survive the second one. Considering how the goal of the first movie was to save the parents, it's a good example of a sequel making the previous work seem like a Shoot the Shaggy Dog. Fringe: Charlie Francis is killed in the first episode of the second season. The Flash (2014), in the season 2 premiere, Ronnie Raymond aka Firestorm sacrifices himself to stop the singularity created at the end of the first season. After being introduced in Season 5, Doran Martell and his son, Trystane, were killed off by Ellaria and the Sand Snakes in the Season 6 premiere. Executive Meddling plays here where Doran's actor, Alexander Siddig, was contracted for four episodes in Season 6 but unbeknownst to him, plans were changed during production. Roose Bolton dies only two episodes into Season 6 after being one of the show's main antagonists for several seasons. Randyll Tarly shows up in only one episode of Season 6 after being mentioned several times since Season 1 and gives a very good impression as Samwell's domineering father who made an impact on his character. Then in the middle of Season 7, he's roasted by Daenerys' dragons. This is justified because Season 7 is shortened to seven episodes. Gilmore Girls had to kill off Richard for the revival, since the actor died between the original and A Year In The Life. Gotham: Sarah Essen is killed in only the second episode of Season Two. Gunsmoke: In the second made-for-TV movie, Matt Dillon got married. Unfortunately, his TV wife, Michael Learned, did not want to return for another movie, so at the start of the next TV movie, we learn her character died of the fever. And just when you thought ONE Western would let somebody enjoy lasting happiness with a beloved. Hannibal: Beverly Katz is killed by Hannibal early on in the second season. Volume 3 dropped bridges on or otherwise wrote out most of the new characters from season 2. One other notable example is Emile Danko, Big Bad of volume 4. After living though the entirety of volume 4, despite every single hero out to kill him, he makes it a whole thirty minutes into volume 5 before he's sliced and diced to death by a guy who doesn't even really know him all that well, just to get a key hidden in his stomach. They even started to build up a story for him for the volume before they, well, Dropped a Bridge on Him. House of Cards US: Zoe Barnes getting thrown in front of a subway train in the second season premiere. Jessica Jones (2015): After being a main character in the first season, Will Simpson gets killed off in the second episode of season 2. Justified: Sammy Tonin is on screen for barely a minute before being killed in the season 5 premiere. Kamen Rider V3 had Kamen Rider Ichigo and Kamen Rider Nigo, the heroes of the original Kamen Rider series, take a nuke to the face after creating V3. They end up returning near the end of the series. Law and Order: The actor who played Sgt. Max Grevey left the show after the first season. In the second season opener, Sgt. Grevey is killed execution-style outside his home while getting papers from his car. It is obviously not the same actor; all we see is his hat and trench coat from the back. Shannon was one of the main characters in season 1 only to get shot a few episodes early on in season 2. Mr. Eko, who was a major character in season 2 but killed off just a few episodes into season 3. Season 4 marks the only time no main characters die early on, although several long-running recurring characters ( Danielle, Alex, and Karl) all get killed off halfway through the season to make up for it. Charlotte is a main cast member in the fourth season and then is killed after only a few episodes of the fifth. Juliet was a main character for several seasons only to die in the first episode of the final season. Justified, as she'd already been mortally wounded at the end of the previous season. Inverted on Mr Selfridge. In real life, Harry Selfridge's wife died in the influenza epidemic of 1918, so she could legitimately have disappeared between seasons 1 and 2. Instead, near the end of the first season she tells her husband she is dying. Night Man: Johnny's father dies in the first episode of the second season. This is due to the fact they moved production to Canada. Once Upon a Time: Greg and Tamara were major villains in Season two, only to both get unceremoniously killed off at the beginning of Season Three. Dr. Nodel and his son Paul were the two main characters of "Double Helix". In The Teaser of the sequel episode "The Origin of Species", they are absorbed by the ship, effectively killing them, as they possess a genetic disease. Prisoner 98843 was the protagonist of "The Camp" but was killed off prior to the events of the sequel episode "Promised Land", having died of undisclosed causes in the week that passed between the two episodes. Alex, a major supporting character in "The Camp", appeared in only one scene of "Promised Land". He died from eating irradiated fruits and plants in the vicinity of Seattle. In the fourth season, the character whose escape from prison had been what the entire previous season's plot centered around was quickly retconned into a different role and shot in the head to clear the decks for an entirely new plot that had little to do with that of the previous season. A more climactic example is Veronica Donovan, who was killed at the end of the Season 2 premiere. Revolution: After a hiatus of several months, Danny, the person the protagonists were trying to rescue for the first half of the season, gets gunned down in episode 11. Robin Hood: The wildly popular guest-star Carter was brought back in the season two finale and saves all the outlaws' lives, only to get the bridge when the Sheriff stabs him to death in a blink-and-you'll-miss-it moment. Scream: The TV Series: Jake survived the first season but was gutted in the first episode of season two. The second Ghostface who survived the second season was killed at the very beginning of the Halloween Special. Justified in that the show is a slasher series. Skins: After all they have been through in season 3 and 4, in the 7th series, Naomi dies, and Emily doesn't even know about it until the very end. Hale gets run over by a van at the end of the Season 3 premiere. And in the very next episode, Cameron Hayes gets killed off. In season 5 premiere , we find out that Laroy died between seasons and then Opie bites the dust in the third episode. Phil in season 6 is a borderline example, being killed 4 episodes into the 13 episode season. Stargate SG-1: Kawalsky, one of the main characters from the previous Stargate movie, gets infested by a Goa'uld and is killed when Teal'c administers a Portal Cut to his head in the second episode of the SG1 series. However, the character continues to recur in hallucinations, illusions, and alternate realities, existing only to die again each time. Except for one time: the alternate-reality Kawalsky in the episode "Point of View" survives. John Winchester gives up his life to save Dean's in the second season premiere. This was nearly averted as John was originally going to die at the end of season one, but the finale was running long as it already was so his death was saved for season two. Castiel winds up getting killed early on during the 7th season. Subverted later on in the same season when it's revealed that he was later brought back to life. Under the Dome: In season 1, Linda Esquivel becomes sheriff after her predecessor's death; she's killed off mere minutes into the second season. Likewise, Angie McAlister was a major character in the first season, but dies at the end of season 2's first episode. V (1983): In the first episode of the sequel series, Martin (a prominent supporting character and fifth-columnist alien) gets dispatched by the Big Bad, Diana, halfway through the first episode. Other resistance members from the miniseries (including Robin Maxwell's father and Elias) are anticlimactically killed off within the first few episodes of the series. Veronica Mars: Cormac Fitzpatrick kills Kendall Casablancas and is then killed by his brother Liam in the season 3 premiere. Kate Ballinger slits her own throat in the season two premiere. You thought season two would be about Ben Burke's rebellion? NOPE. He's devoured by Abbies in the second episode. Nurse Pam is also killed by Jason in the third episode. Falstaff, the Ensemble Dark Horse of Shakespeare's Henry IV plays, has apparently died early on in Henry V, and there's a scene where Falstaff's friends are discussing it. While not quite as sudden as many of the other examples on this page, and seen as sort of a consequence of Prince Hal (Henry V) disassociating himself from Falstaff, it seems as if this trope is older than film, and in fact Older Than Steam. Some adaptations of this, such as Olivier's 1944 film version, play the announcement of Falstaff's death as a giant audience tease, with the bishop first bringing up Falstaff and pausing, enough to get the audience anticipating the arrival of the fan-favourite clown, before relating that he is in fact banished. Some critics believe Falstaff was originally slated to appear in Henry V but Shakespeare decided it would distract people from the hero, so he wrote Falstaff out and gave the lines to Pistol, a very minor character in the prequel. Another theory is that it was connected to Will Kempe (the comic actor believed to have played Falstaff) quitting the company in unknown but likely acrimonious circumstances. Lampshaded in The Order of the Stick, in which after helping Elan Take A Level In Badass, Julio Scoundrel tells him that to avoid dying, he never wants to see him ever again. However, he does later come to save him after being convinced that the greatest heroes are those who can defy genre conventions. Bert was one of the few to survive the original "KITTEN" arc in Sluggy Freelance (albeit with a mangled prostate), but is unceremoniously killed off during "KITTEN II." Adam Dodd, the survivor of Survival of the Fittest v1, was tossed in a second time in v3. Partway through, he mysteriously disappears, and is presumed dead, along with a bunch of other characters. However, subverted by a later reveal that they all had managed to remove their collars and were Faking the Dead, including Adam himself. An in-universe example occurs with Sydney Morvran. The winner of v0 (the prequel to v1), he is put into the next version as punishment for not actively killing anyone, and then becomes one of the first fatalities. On Young Justice, Garfield's mom Marie was killed in the Time Skip between seasons. The tie-in comic reveals it to be a Psychic-Assisted Suicide from a vengeful Queen Bee. Similarly, Tula/Aquagirl joined the team and died between seasons, with her death being the catalyst for another character's FaceHeel Turn. At least, that was his excuse for joining the villains - he was really a Fake Defector.